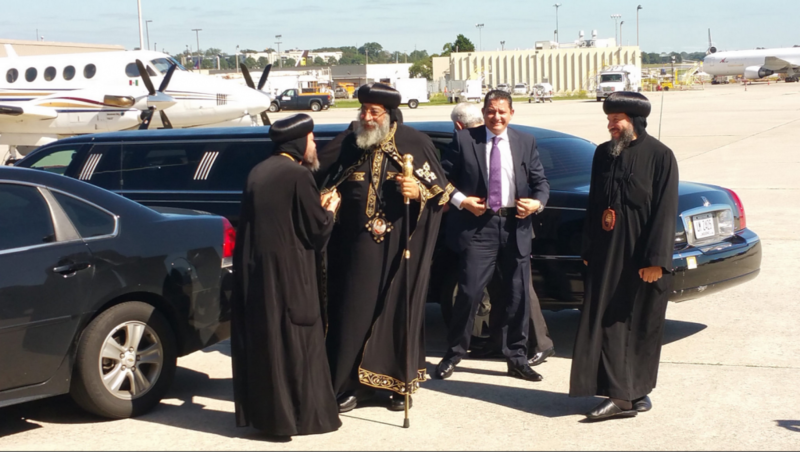 His Holiness Tawadros II, Pope of Alexandria and Patriarch of the See of St. Mark the Apostle, landed in the United States today and was greeted by several bishops and members of the clergy in Atlanta, including Bishop Serapion. His Holiness begins a three-week visit to various parts of the United States to meet with his children throughout the various dioceses and parishes as well as governments and religious leaders. God willing, he will arrive in Los Angeles on Wednesday, October 14 with a reception at St. Mark Church in Los Angeles. May the Lord preserve him along with our fathers the bishops and keep them safe and secure for us.